Automating your marketing can save you time and hassle, and give your sales team useful information about leads, so they know whom to talk to, and what to pitch. The good news? 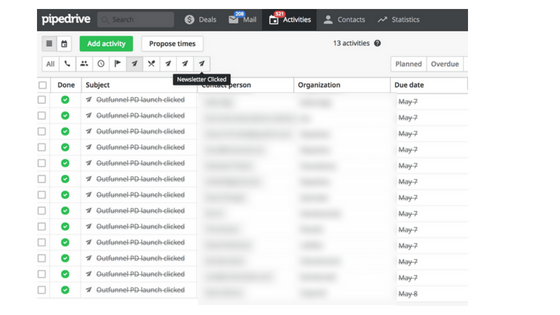 Marketing automation for Pipedrive is easy with Outfunnel. It takes less than 30 minutes to implement everything described in this post. As a salesperson, wouldn’t it be great to see which emails people that I want to speak to have received, opened and clicked? Unbelievably (read: predictably), this is one of the things you get with Outfunnel. Have unsubscribes and even bounces recorded in Pipedrive, so you can plan follow-up activities. The default setting is syncing all Mailchimp audiences (or Lists, as they were known previously), but you can also send email activity from specific Audiences only. Usually, when you need to send out a newsletter, there’s a bit of last-minute scrambling to extract the list. You’ll want to exclude people that you’ve parted ways with, include recent customers and maybe also exclude the very VIP customers that get their information from Account Managers over a lush dinner. You’ll also need to account for people that have changed jobs or email addresses, and that have unsubscribed from your marketing emails. Step 3. Sync the filter you’ve defined in Step 1 with the audience you’ve selected in Step 2 with Outfunnel. Then, whenever you need to send a newsletter, just open Mailchimp and send away, the mailing list is up to date even if customers have come or gone or changed statuses recently. Read more about using our Pipedrive-Mailchimp integration. Oh, and you can have this information automatically added to your Pipedrive deals and contacts as well. Read more about our web tracking feature. If your marketing emails are any good, people tend to engage with them. You can then use these signals for lead qualification. For example, if you have a 1000 people in your newsletter list and if 15 clicked on “Check out this new service” link, these 15 are probably your warmest leads. With Outfunnel you can automatically create new Deals when people click on links in your newsletter. 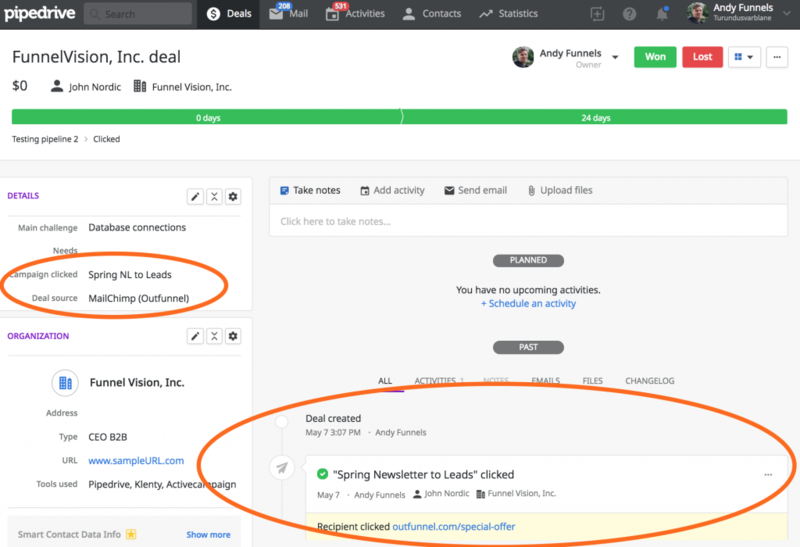 This deal was created automatically by Outfunnel once a lead had clicked a newsletter. Step 1. 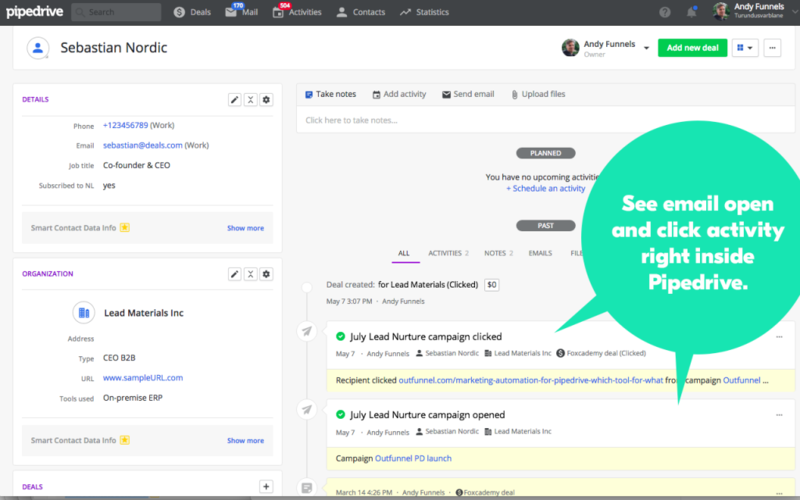 Log in to Outfunnel and go to Connections and set up a new MailChimp to Pipedrive automation. Step 4. Send email campaigns from Mailchimp the same way you’ve always done, and take advantage of new Deals appearing in Pipedrive. Wouldn’t it be nice if an email or a series of emails went out if a Deal reached a certain stage in your pipeline? And you’d like the email drip to end once they’ve moved on from that stage? Automated email marketing for Pipedrive? Well, you can make this happen with Outfunnel. Step 3. Set up a Pipedrive to Mailchimp sync that automatically adds people you’ve defined in Step 1 to audience you defined in Step 2. Step 4. Lastly, set up a Mailchimp automation campaign you’d like the relevant people to receive, where you set “people join or imported to your list” as the trigger. Smart salespeople find ways to qualify leads even before having a conversation, and prospects clicking on marketing emails or visiting your site is a great proxy. 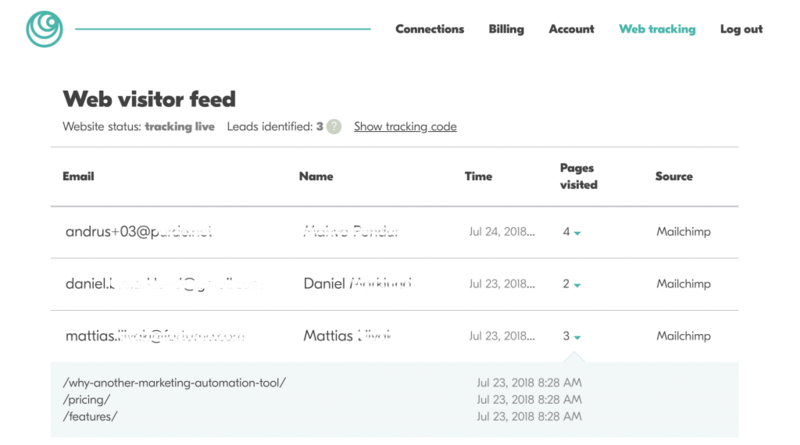 If you’ve configured Outfunnel to record email opens/ clicks or website visits as Custom activity in Pipedrive, you can later use Activity filters to build a call list. Simply navigate to the Activities tab, define the date range and choose either “Newsletter Opened”, “Newsletter Clicked” or “Website visit” as the activity to be filtered. Step 2. However you’ve defined the “Lost but follow up” segment, you can then use this event as a trigger to start a lead nurturing sequence. And here I don’t advocate dumping all leads into a generic newsletter list but really add value with your content. Step 2. Take the five minutes it takes to make sure your Pipedrive filters that you use to define campaign lists reflect that. Step 3. Set up a new Pipedrive to Mailchimp automation to keep your mailing list and this exclusion filter up-to-date. All of the above automations (or “hacks” as some call them) are quick to set up and very affordable, compared to buying a monolithic large tool that does a little bit of everything. Here’s to hours saved and additional leads generated!